Paul is the most powerful human personality in the history of the Church. 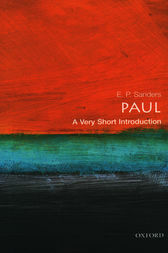 A missionary, theologian, and religious genius, in his epistles he laid the foundations on which later Christian theology was built.In his highly original introduction to Paul's life and thought, E. P. Sanders, whose research on Paul has substantially influenced recent scholarship, pays equal attention to Paul's fundamental convictions and the sometimes convoluted ways in which they were worked out.ABOUT THE SERIES: The Very Short Introductions series from Oxford University Press contains hundreds of titles in almost every subject area. These pocket-sized books are the perfect way to get ahead in a new subject quickly. Our expert authors combine facts, analysis, perspective, new ideas, and enthusiasm to make interesting and challenging topics highly readable. E. P. Snaders is Arts and Sciences Professor of Religion at Duke University. He was formerly Dean Ireland's Professor of Exegesis in the University of Oxford and Fellow of The Queen's College. His books include Paul and Palestinian Judaism (1977), Paul, the Law, and the Jewish People (1983), and Jesus and Judaism (1985).